Transform your desktop or your laptop to a Credit Card payment station. A technology specially conceived for mobile Professionals, or transportable Information Stands. Connected to your Web application and from your computer: bill your customers and fill your bank account! 2 - In the web page, manually indicate the amount to pay. Or retrieve it from your caddy. 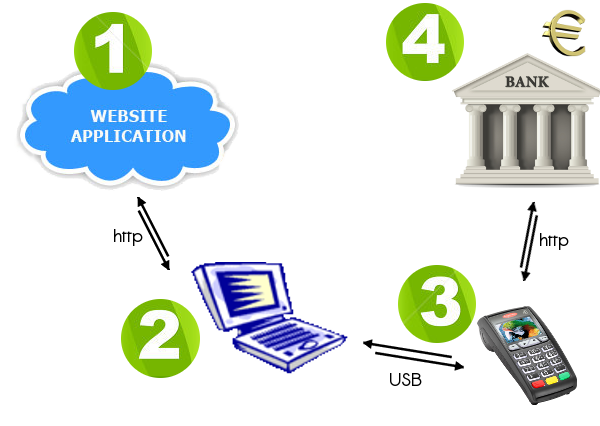 3 - The Web application directly sends details to the Ingenico ICT250, through your computer. Then the payment terminal waits for the credit card to complete the operation. 4 - When the payment is accepted, the Terminal tells the bank and funds can directly go to your account. The web application is informed as well, so your distant DataBase is updated. Some stations don't need to be under the heavy and traditional Payment Operation Systems. A Cloud application linked to a few computers properly configured can be enough. Potentially mobile, these stations are connected and synchronized to the company Information System via a Web application. Cashiers or hostesses can prepare the caddy online, complete the payment transaction, and then print the receipt for the customer. Then, The central database is automatically updated and the operation is recorded in the system. 2 - Mobile Payment Stations for General Practitioners or Travelling Salesmen. Contact us to install this technology in your machines. We can develop your accountancy application, or we can adapt our system to your existing Software. This technology is compatible with Windows Systems (Pro & +) and Linux / Unix Systems (recommended).